Preston's creaky defence was again exposed as Derby stretched their unbeaten Championship run to five. Dean Moxey opened the scoring with a goal that should have been kept out by Preston goalkeeper Andy Lonergan. A header from on-loan Spanish forward Alberto Bueno, following an assist from Shefki Kuqi, gave Derby a cushion. And when Russell Anderson was brought down by Keith Treacy in the area, Robbie Savage slotted home the penalty on his 600th career appearance. Savage, who turns 36 on Monday, was part of a Derby midfield who dominated their opponents throughout. With some sharp passing and movement, they forced Preston onto the back foot straight from the outset and took 21 minutes to go in front. Bueno picked out left-back Moxey and his left-footed cross-shot should have been dealt with by Lonergan, but the Lilywhites goalkeeper was beaten at his near post. His opposite number Frank Fielding, making his debut after being signed on loan from Blackburn on Friday, was tested for the first time 26 minutes, easily coping with Jon Parkin's strike. 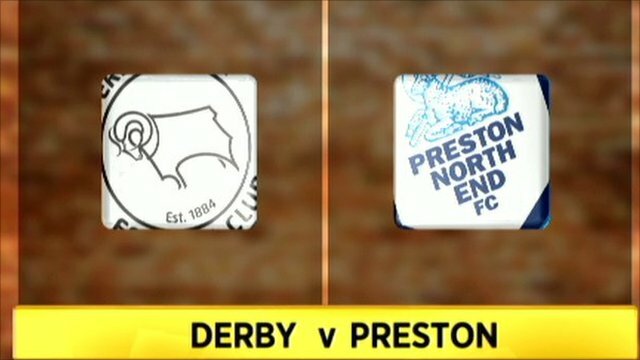 After Derby's well-worked second goal, Preston finally showed more ambition in the second half. First Treacy drilled a shot from long range which Fielding palmed away and he then did well to keep out Sean St Ledger's header. Derby had the final say as Savage converted his penalty after Treacy, who had already been booked, was sent off. 90:00+4:02 The referee brings the game to a close. 90:00+2:59 Foul by Keith Treacy on Russell Anderson, Penalty awarded. 90:00+2:59 GOAL - Robbie Savage:Derby 3 - 0 Preston Robbie Savage scores a penalty. Derby 3-0 Preston. 90:00+2:08 Sent off Keith Treacy sent off. 90:00+0:27 Corner taken right-footed by Iain Hume to the near post, Shaun Barker manages to make a clearance. 89:51 Corner taken by Keith Treacy, Dean Moxey manages to make a clearance. 88:23 Luke Moore is penalised for a handball. Direct free kick taken by Craig Morgan. 88:23 Substitution Shefki Kuqi leaves the field to be replaced by Russell Anderson. 86:30 Free kick awarded for an unfair challenge on Tomasz Cywka by Paul Parry. Free kick crossed left-footed by Ben Pringle from right wing, clearance made by Callum Davidson. 85:52 Paul Parry gives away a free kick for an unfair challenge on Tomasz Cywka. Robbie Savage takes the free kick. 84:41 Dean Leacock fouled by Iain Hume, the ref awards a free kick. Direct free kick taken by Dean Leacock. 84:41 Substitution Paul Hayes joins the action as a substitute, replacing Jon Parkin. 81:15 Luke Moore gives away a free kick for an unfair challenge on Paul Coutts. Paul Coutts restarts play with the free kick. 80:52 Substitution (Derby) makes a substitution, with Ben Pringle coming on for Kris Commons. 80:04 Inswinging corner taken by Keith Treacy from the right by-line, save by Frank Fielding. 78:24 Shot from outside the box by Paul Coutts misses to the left of the goal. 78:24 Substitution Adam Barton leaves the field to be replaced by David Gray. 78:24 Substitution (Preston) makes a substitution, with Paul Parry coming on for Joshua King. 77:37 Shaun Barker concedes a free kick for a foul on Jon Parkin. Iain Hume takes the direct free kick. 77:12 Foul by Tomasz Cywka on Keith Treacy, free kick awarded. Andy Lonergan takes the direct free kick. 76:09 Effort from deep inside the area by Kris Commons misses to the left of the target. 75:23 Tomasz Cywka produces a right-footed shot from just outside the box that goes wide right of the goal. 74:54 Corner taken by Kris Commons, Sean St. Ledger makes a clearance. 74:21 Kris Commons takes the inswinging corner, clearance by Sean St. Ledger. 71:45 Substitution (Derby) makes a substitution, with Luke Moore coming on for Alberto Bueno. 71:14 Billy Jones takes a shot. Save by Frank Fielding. 69:21 Foul by James Bailey on Iain Hume, free kick awarded. Shot comes in from Keith Treacy from the free kick. 68:52 Free kick awarded for an unfair challenge on Billy Jones by Kris Commons. Craig Morgan takes the free kick. 67:50 Iain Hume concedes a free kick for a foul on Kris Commons. Free kick crossed right-footed by Robbie Savage, clearance made by Paul Coutts. 66:50 Inswinging corner taken right-footed by Iain Hume from the left by-line, clearance by Shaun Barker. 64:46 Corner taken left-footed by Kris Commons from the right by-line to the near post, clearance made by Jon Parkin. 64:11 Foul by Jon Parkin on Robbie Savage, free kick awarded. Free kick taken by Kris Commons. 64:11 Booking Jon Parkin receives a caution. 62:35 Corner taken right-footed by Alberto Bueno from the right by-line to the near post, Sean St. Ledger manages to make a clearance. 62:09 Keith Treacy challenges Alberto Bueno unfairly and gives away a free kick. Kris Commons takes the free kick. 62:09 Booking Keith Treacy is shown a yellow card for unsporting behaviour. 60:41 Corner taken right-footed by Iain Hume from the left by-line, Paul Coutts takes a shot. Frank Fielding makes a comfortable save. 60:24 Short corner taken by Keith Treacy from the right by-line. 60:03 Corner taken by Keith Treacy played to the near post, Robbie Savage makes a clearance. 59:34 Keith Treacy takes a shot. Frank Fielding makes a save. 57:53 Inswinging corner taken left-footed by Kris Commons, Craig Morgan fouled by Shaun Barker, the ref awards a free kick. Andy Lonergan takes the free kick. 57:20 Inswinging corner taken by Kris Commons from the right by-line played to the near post, Craig Morgan manages to make a clearance. 54:24 Free kick awarded for a foul by Iain Hume on Kris Commons. Shot on goal comes in from Kris Commons from the free kick, save by Billy Jones. Close range effort by Alberto Bueno goes wide of the left-hand post. 53:35 Kris Commons has an effort at goal from outside the penalty area which goes wide right of the goal. 51:42 Billy Jones concedes a free kick for a foul on Kris Commons. Free kick taken by Robbie Savage. 50:54 Kris Commons has shot on goal from just outside the box which goes wide of the right-hand upright. 50:21 Inswinging corner taken from the left by-line by Iain Hume, Dean Moxey manages to make a clearance. 49:43 Corner taken short by Iain Hume, Dean Leacock manages to make a clearance. 45:00+1:26 The whistle is blown to end the first half. 45:00+0:57 The referee blows for offside against Shefki Kuqi. Andy Lonergan takes the free kick. 44:44 Effort from long range by Keith Treacy goes wide of the left-hand upright. 44:15 Unfair challenge on Craig Morgan by Alberto Bueno results in a free kick. Free kick taken by Sean St. Ledger. 42:35 The assistant referee signals for offside against Joshua King. Frank Fielding takes the indirect free kick. 41:25 Kris Commons is ruled offside. Free kick taken by Sean St. Ledger. 40:09 The assistant referee signals for offside against Jon Parkin. Robbie Savage takes the free kick. 37:12 Unfair challenge on Paul Coutts by Kris Commons results in a free kick. Andy Lonergan takes the free kick. 36:22 Craig Morgan concedes a free kick for a foul on Shefki Kuqi. Robbie Savage restarts play with the free kick. 36:06 Paul Coutts takes a shot. Robbie Savage gets a block in. 34:00 Free kick awarded for an unfair challenge on Callum Davidson by Shefki Kuqi. Sean St. Ledger takes the direct free kick. 31:31 Shefki Kuqi provided the assist for the goal. 31:31 GOAL - Alberto Bueno:Derby 2 - 0 Preston Alberto Bueno scores a headed goal from close in. Derby 2-0 Preston. 31:14 Kris Commons takes a shot. Blocked by Callum Davidson. 30:36 Callum Davidson gives away a free kick for an unfair challenge on Robbie Savage. Free kick taken by John Brayford. 30:36 Booking Booking for Callum Davidson. 28:28 Alberto Bueno produces a right-footed effort from long distance that goes harmlessly over the bar. 26:59 Unfair challenge on Tomasz Cywka by Paul Coutts results in a free kick. Direct free kick taken by Robbie Savage. 26:59 Booking Paul Coutts booked. 26:25 Jon Parkin takes a shot. Comfortable save by Frank Fielding. 24:51 Foul by Shefki Kuqi on Sean St. Ledger, free kick awarded. Sean St. Ledger takes the free kick. 24:12 Keith Treacy has an effort at goal from outside the penalty area which goes wide right of the goal. 23:09 Alberto Bueno takes a inswinging corner from the left by-line played to the near post, Billy Jones makes a clearance. 22:48 Kris Commons takes a shot. Craig Morgan gets a block in. 20:33 Assist on the goal came from Alberto Bueno. 20:33 GOAL - Dean Moxey:Derby 1 - 0 Preston Dean Moxey fires in a goal from outside the penalty box to the bottom left corner of the goal. Derby 1-0 Preston. 18:30 Iain Hume fouled by Dean Leacock, the ref awards a free kick. Craig Morgan takes the free kick. 15:07 Corner taken by Kris Commons, save by Andy Lonergan. 12:12 Shefki Kuqi takes a shot. Sean St. Ledger gets a block in. 11:25 Unfair challenge on Paul Coutts by Tomasz Cywka results in a free kick. Sean St. Ledger restarts play with the free kick. 10:41 Kris Commons fouled by Billy Jones, the ref awards a free kick. Direct free kick taken by Robbie Savage. 10:16 Kris Commons takes a long range shot clearing the bar. 9:51 Free kick awarded for an unfair challenge on Kris Commons by Sean St. Ledger. Robbie Savage takes the free kick. 9:26 Jon Parkin handles the ball and concedes a free kick. Dean Leacock takes the direct free kick. 8:02 Corner taken by Iain Hume played to the near post, free kick awarded for an unfair challenge on Frank Fielding by Jon Parkin. Free kick taken by Frank Fielding. 7:35 Corner taken by Callum Davidson from the right by-line, save by Frank Fielding. 7:12 Adam Barton takes a shot. Blocked by James Bailey. 5:18 Alberto Bueno takes a inswinging corner from the left by-line to the near post, clearance made by Jon Parkin. 4:35 The referee blows for offside against Tomasz Cywka. Free kick taken by Andy Lonergan. 2:33 Foul by Sean St. Ledger on Shefki Kuqi, free kick awarded. Free kick taken by Robbie Savage. Correction - 1:59 Foul by Shefki Kuqi on Sean St. Ledger, free kick awarded. Andy Lonergan takes the free kick. 1:59 Foul by Shefki Kuqi on Sean St. Ledger, awarded. 1:30 Unfair challenge on Dean Leacock by Jon Parkin results in a free kick. Free kick taken by Frank Fielding. 0:45 Free kick awarded for an unfair challenge on Paul Coutts by Robbie Savage. Sean St. Ledger restarts play with the free kick.